Gor Mahia’s towering central defender Harun Shakava has been given the captains armband by coach Dylan Kerr. Shakava takes over from Musa Mohamed who has departed to KF Tirana. 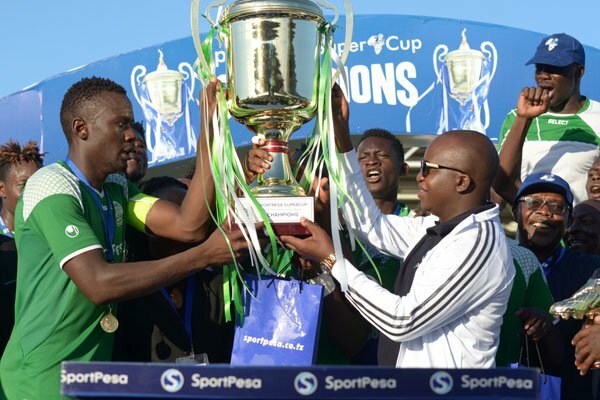 Shakava has captained Gor Mahia before, most notably at the 2017 Sportpesa Supercup. Unlike in past seasons where players voted for the captain, this time it was a direct appointment by coach Dylan Kerr. Indeed most Kogalo captains have historically been defenders, most notably Julius Owino and Musa Mohamed and going back much further it was Peter Otieno “Bassanga”, Austin Oduor “Makamu” and Paul Ochieng “Kunde”. Fans should trust coach Kerr’s judgment as he it is he who observes the players at close hand and knows which ones have good leadership qualities. Also Musa Mohamed’s game significantly improved when he was named captain. The same can be expected of Shakava. Harun Shakava joined Kogalo before the 2014 season after an impressive run at Kakamega Homeboyz. Goalkeeper Boniface Oluoch has been named as Vice Captain. Oluoch joined Kogalo in 2015, taking over the starting goalkeeper spot from the long serving Jerim Onyango. Hongera Shakava kwa majukumu mapya lakini Oluoch eish! Is he not the same Oluoch who was alleged to have slapped Nutall? There have also been allegations that he wanted to arm twist the TB to give him playtime despite his underperformance. I have my reservations here, BlackBerry would have been better. man ingo,kwani u still had doubts.sisi ni mashemko fullstop. The past FKF Sec Gen, Robert Asembo, Jaffery Maloba, the late Vin Machembe and Anthony Lugongo, are all names associated with my Shemejis yet they proved to be my greatest friends in high school. We together watched the Shemejis do battle in the fields but never could we imagine this happening. Congrats Haron, you deserve it. This should cement the bond and the trust that we have as a people. Go ahead and lead Kogalo to greater heights. The appointment of Boniface Oluoch as assistant captain is very much in order. Leadership and a position of responsibility has been observed to promote discipline and maturity in fellows who could otherwise be truants. Congratulations shakava for your elevation as the captain of this great club in East and Central Africa. Know that your name will be among great names that captained this great club.You must now know that being a captain, you are the leader and you must know how you handle your colleagues in the pitch and out of the pitch. You must also know that you are Gor mahia and Gor mahia is you. Don’t provoke fans to interfere with proceedings on the pitch. Improve on your discipline so that you earn your respect from referee’s with bad intentions. I have always admired you but maybe your discipline haven’t been good to make you win defender of the year. BREAKING NEWS ! with offers to enter UGanda market flooding their doorsteps and contract with Kogallo officially lapsing on 30th January , Sportpesa set to make an announcement next week, setting a monthly revenue targets for both Kogallo and Efusi as a condition for new contract to be signed…………..Can this be done ? Admin, wasn’t the infatigable, irrepressible, hard tackling, hot shot legendary Gor Mahia center back / stopper John “Bobby” Ogola aka “6 million $ man” a K’Ogalo CAPTAIN? As we wait and hope for SP to reconsider let EC remember how high and dry these sponsors always leave us at the first sign of trouble. Can’t we ever learn from the past Tuzo, Castle & even SP experiences. We need a plan B but that said only a good CAF performance will maintain and attract sponsorship. Best of luck H.S. Btw Musa Muhamed may be a shemeji, what’s his middle name? I think Musa is our brother from S. Sudan…. @Jakoyo, Do you have the details of what the Monthly Revenue Target is? If you do then please let us know. We can then begin to look at it against our avenues of revenue generations or collection. It is only then that we shall be able to respond to your question. @jaupanda when i read some of the bloggers post here am really motivated to read the next post.u guys really do nt joke with matters Gor.jakoyo your quetion is hanging,pls tie the loose ends so that we get the point. Congrats Shakava for the captaincy, you deserved it.